I’ve been using an ISO 70 water bottle from Laken. It’s a modern-looking, but very functional water bottle made in Spain. I received the bottle for free from Laken for review purposes. It holds a large amount of water. It’s insulated, keeping things cooler than my SIGG did. Wide-mouth opening means bottle is easier to clean. 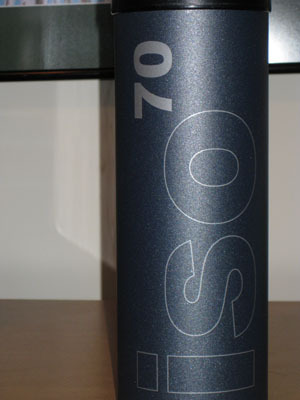 Like all Laken bottles, ISO 70 is certified BPA free. It’s comfortable to carry around. The only disadvantage I found is that the bottle may not fit in smaller drink carriers in some cars. It fits fine in my husband’s truck, but wobbles a little in my Civic drink holder. Overall, I’m impressed with the bottle. It seems to be very durable and well made. Have you tried any Laken water bottles? Does the BPA-free certification make you feel more comfortable trusting Laken? Thanks for the review, now I know what to look for. Hello. Thanks for the review! It would be nice if you could include the material the bottle is made from. Is it stainless steel? Aluminum? Thanks for keeping us updated :). Thanks Emily. The bottle is aluminum with a BPA-free lining on the inside. My husband takes this water bottle to work daily and it’s held up very well.